Rep. Raul Ruiz and challenger Kimberlin Brown Pelzer have been trading barbs over immigration, taxes and each others’ records on the campaign trail for more than a year, but before last week, had yet to discuss the issues animating the race face-to-face. The two candidates vied Thursday for an endorsement from the media company’s editorial board, which has endorsed Ruiz’s candidacy in the past three elections. Ruiz, a Democrat from Coachella, and Brown Pelzer, a Republican actress-businesswoman from Palm Springs, answered questions on issues ranging from taxes to immigration to health care. Ruiz summarized his record of achievements and bills he’s contributed to while in Congress, while Brown Pelzer highlighted her experiences as a businesswoman and said Ruiz had failed to distinguish himself during his three terms in office. Ruiz and Brown Pelzer diverged on the recent tax cuts. The congressman said cuts have disproportionately benefited the wealthy at the expense of the middle class. Brown Pelzer, citing her experiences as a business owner, said the tax cuts had allowed businesses to grow and decreased unemployment. If elected to Congress, she said she would advocate making the cuts permanent. Both candidates said they support enhancing the technological capabilities of border patrol agents, but clashed over the ongoing construction of a border wall. 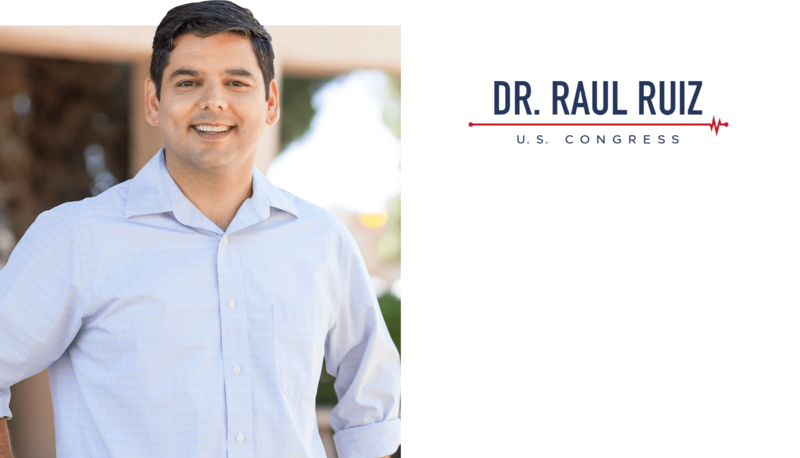 “I don’t support a border wall because it’ll be ineffective, a waste of taxpayer dollars, and was borne in a politics of hatred,” Ruiz said. Building a wall, Brown Pelzer said, would curb human trafficking and drug smuggling by limiting the passage of goods and people to checkpoints. “If you narrow access points, you force illegal traffic in one direction. It’ll cut down on the problem,” she said. Ruiz and Brown Pelzer expressed different views on gun control and the #MeToo movement. Brown Pelzer said her support of the Second Amendment and her feeling that women need to be protected stems from personal experience. Brown Pelzer said she slept with a gun beside her for three years after a series of events — that she did not describe —made her fear for her life. Brown Pelzer said the #MeToo movement brought up real concerns about women’s safety that she felt particularly strongly about because her daughter was a victim of sexual violence. But she also called into question the political motives behind the #MeToo movement, which she said merited a government investigation. Ruiz said his perspective on guns and sexual violence is based on his experience as an emergency room doctor, where he cared for patients with gunshot wounds and also victims of sexual violence. He said he would push for Center for Disease Control funding that would allow the agency to research gun violence as a public health issue and close loopholes that allow for the purchase of firearms at gun shows and on the internet without background checks. In light of the #MeToo movement and high-profile allegations of sexual violence, Ruiz said lawmakers should strengthen anti-harassment training and education requirements in businesses. The session became heated after Ruiz attacked Brown Pelzer for echoing Trump’s comments on the media, citing a speech she made in Banning. Brown Pelzer has repeatedly claimed the press is against her since a July Desert Sun article called into question an assertion she made about Ruiz’s record and the number of bills he had passed. Even though the remarks Ruiz cited can be seen on her public Facebook page, she told the Editorial Board she did not make the statements. Brown Pelzer and Ruiz disagree on when members of Congress can count bills and amendments they author as their own. Ruiz told the Editorial Board that seven bills and two amendments he authored have been enacted into law. Brown Pelzer responded that she and her staff had not been able to find evidence of the bills. The different counts stem from the candidates’ disagreement about which bills Ruiz could count as his own. The congressman said it is regular procedure in the House of Representatives for bills to be enacted into law through becoming parts of larger bill packages. Brown Pelzer said politicians could only count bills as their own if they’re listed on the legislation when it’s signed by the president. Under her own rubric, Brown Pelzer’s statement is accurate; no bill that Ruiz has served as primary author on has been signed by the president. But to residents affected by legislation, Ruiz said, the content of final bills is more important than the author listed. Bills he introduced that were later passed as part of larger bill packages with his original text intact include H.R. 1183, his 2017 Wildfire Prevention Act that was passed into law as part of the 2018 Bipartisan Budget Act, which brought funds to small communities ravaged by wildfires like Idyllwild, he said.